The Blue Wave is real. And there are all sorts of waves. The Democrats impressive takeover of the House of Representatives and so many State Houses has been more the rolling kind. This week on The Halli Casser-Jayne Show we dive into the blue wave and into the storied political coverage of The New York Times when joining me at my table is my partner in politics, journalist Matthew Cooper, and former editorial page editor of The New York Times, Andrew Rosenthal, here to discuss his new book, with a foreword by Maureen Dowd, THE NEW YORK TIMES BOOK OF POLITICS: 167 YEARS OF COVERING THE STATE OF THE UNION, Andrew Rosenthal. 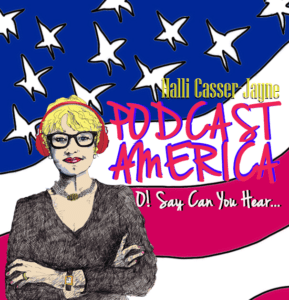 The podcast will be posted on all your favorite sites and apps and at Halli Casser-Jayne dot com. As he does each week, newsman Matthew Cooper joins Halli for their politics segment, PODCAST AMERICA, in which Matt and Halli slice and dice all things politics. And what a week it has been. The Blue Wave is real. Democrats continue to rack up House seats, Florida remains Florida as a recount was ordered in both the Governor and Senate races. Trump ousted Attorney General Jeff Sessions and replaced him with a WWE-like loyalist, Matthew Whitaker. Trump had a hissy fit in Paris where it drizzles, the Robert Mueller investigation continues on. Then First Lady Melania Trump also had a fit, Nancy Pelosi is fighting for her Speakership, and we’re just beginning. In our second half hour we’re joined by former New York Times editorial page editor and now author of THE NEW YORK TIMES BOOK OF POLITICS, Andrew Rosenthal. For 167 years, The New York Times has been in the forefront of political reporting — from memorable campaigns and elections to controversial legislation, scandals, and issues ranging from immigration, race, and gender to the economy and war. In today’s turbulent times, the newspaper’s political coverage is more relevant than ever; not only for the news itself, but because of the paper’s leadership in defending the freedom of the press, a freedom being sincerely challenged in the age of Trump. 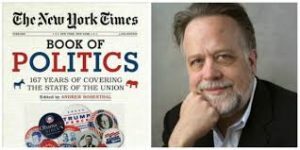 In the new BOOK OF POLITICS: 167 YEARS OF COVERING THE STATE OF THE UNION, noted former NEW YORK TIMES editorial board editor ANDREW ROSENTHAL, has compiled an anthology that explores the newspaper’s broad scope of unparalleled political coverage and examines what has changed over the decades and how history has—often dramatically—repeated itself in surprising ways. With a foreword by acclaimed columnist Maureen Dowd, including 60 photographs as well as reproductions of front-page stories, here are the noteworthy political articles from The New York Times archives that are sure to engross readers. The Blue Wave is Real, Trump underwater, the Florida recount, politics and The New York Times, Robert Mueller, Melania Trump, loyalist Matthew Mueller…join Halli and Matthew Cooper and Andrew Rosenthal on The Halli Casser-Jayne Show the podcast posted 3 pm ET at Halli Casser-Jayne dot com.